Home Cricket Analysis Does Lord’s 2014 remind of Eden Gardens 2001? Does Lord’s 2014 remind of Eden Gardens 2001? 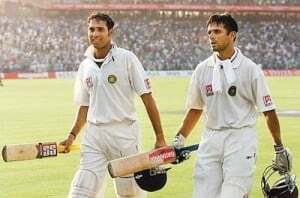 “That was one inning for which I and Laxman would always be remembered”, were the proud words of Rahul Dravid when I enquired him about his legendary partnership with his friend VVS Laxman, who went on to script one of the finest knocks ever played in test cricket. Let me rotate back the time wheel and meet you into the stands of Eden Gardens on March 11, 2001. Australian cricket team has arrived into the city of Joy post conquering five test playing nations en route their winless record streak of 16 matches. Young Indian team, trying to find its feet amid ruins of controversies, guided by a new captain in form of local boy Saurav Ganguly has been thrashed by 10 wickets in the first test match of the series in the home of India’s favorite son, Mumbai. There is a sense of disbelief among the Indian fans. Match fixing controversy has heated up Indian cricket and Indian team is finding it hard to collect itself to form a unity. With that cricket moves on to its next destination Eden Gardens, Mecca of Indian Cricket. But for the next five days cricket chose to evolve through the holy contest between bat and ball as India and Australia went on to play arguably the best ever test match, the description of which is never needed for any Indian Cricket aficionado. The way Indian team played that match reinstated the belief of billions of Indians into the team and many heroes were chosen to emanate through the sky of Indian Cricket team for years. That match saw an enthusiasm that was repeated again after 13 years, and this time the venue was the Mecca of Cricket, Lord’s. Coming back to Lord’s 2014, Indian team had been winless in 15 overseas test matches for last three years. Captain’s strategies were under scanner and believers of Indian Cricket were hassled over the defensive Indian approach towards the game. As the team arrived in Lord’s, controversies found its way back with the physical spat between Ravindra Jadeja and James Anderson. Team combination raised eye brows as none could find a justification of Stuart Binny in the playing eleven. As the match progressed, Indian team found it hard to stand against the boosted English pacers on a track not so different from the outfield. But for the next five days, Indian Cricket team found itself rejuvenated with the united hands of 11 youngsters fighting it in the opponent’s den. Ajinkya Rahane played a VVS-que inning to carve out his name on the honor’s board. Dhoni asked Bhuvaneshwar to bowl an extended spell and he agreed with a victorious smile. Jadeja counter attacked the English bowlers as if he was playing for his mother’s life, indeed he was, playing for India. Vijay played an inning that brought him one step closer to achieve a permanent place as an opener. Last inning saw Ishant Sharma creating history at the divine foyer of International Cricket, Lord’s. There were many heroes. What’s similar in Eden Garden’s 2001 and Lord’s 2014? Both the matches are different in their own style. Kolkata was a high scoring affair. Lord’s chose to keep it short. But the enthusiasm with which Indians played this game could match only that of the players making the hurdle before the start of Eden Gardens’01. The players who appeared in Kolkata test went on to become important members of the Indian Cricket team for next decade. Indian cricket had changed and had found a new leader with aggression in form of Saurav Ganguly. The players kept getting better and better and ten years from then, India went on to become top ranked team in tests. That match started a story that was continued by the Indian team for next 10 years in golden letters. The players involved in that match went on to become legends. That match went on to become folklore. 13 years on the road, India passed through similar phase. Can this match remark the birth of modern Indian cricket team that can repeat the heroics of invincibles from the first decade of the century? Can this victory unite the strength of a billion hands and pass that into the hearts of the 11 players fighting out in the middle for India? India has found many heroes from this game. Can they go on to become legends? Only time has the answer to this. But for now, the Indian Cricket team can seek inspirations from its batting consultant, a reason behind that folklore being created. And the legend who rang the bell at Lord’s to start the 5th day’s play was Saurav Chandidas Ganguly, the leader who led lions. The message was clear, “the legacy has been passed”. I believe, next decade for the Indian ricket is going to be legendary.